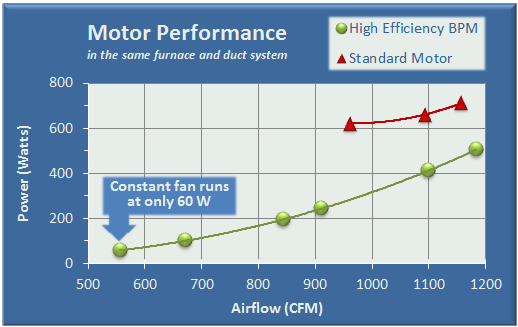 What can a high efficiency fan motor do for you? A survey of homes where high efficiency fan motors were installed found fan energy use reductions of between 30% and 60% for most homes. 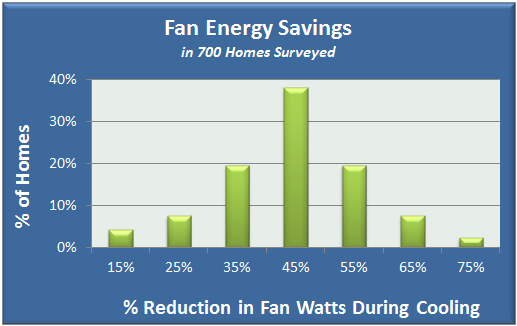 Some homes saved as much as 700 Watts. Do you run your fan all the time? A high efficiency fan motor is a great energy saving improvement for every home, but if you run your indoor fan constantly to filter the air or just to keep air moving around your home, the savings increase from big to REALLY BIG. Homes with constant ventilation needs can enjoy up to 80% savings compared to a standard fan motor.